Hangzhou Wen’er Road–Our Street. 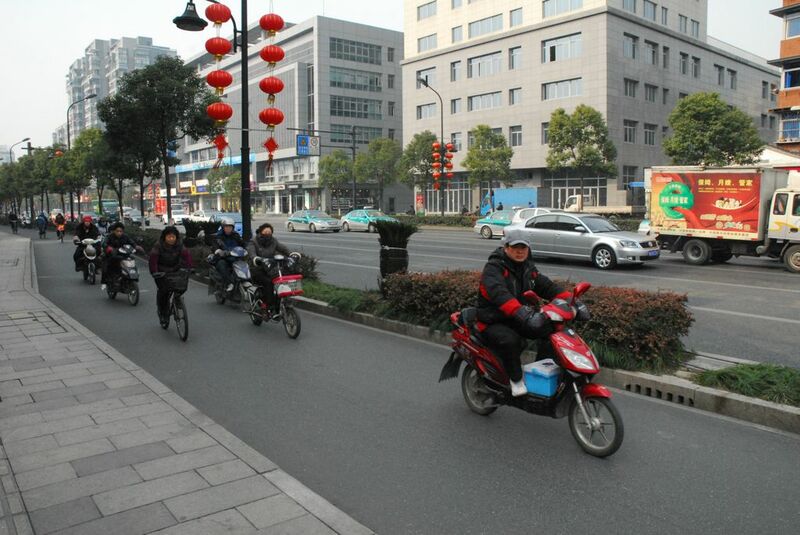 Notice the bicycle and motorbike lane between the main street and the sidewalk. Also, you can see decorative paper lanterns hanging from the street light in celebration of the new year, which will end in a day or so. I have quickly discovered the two most important items for travel: duct tape and coffee. Never go anyplace without either. Once I figured out how to use duct tape to keep the second burner on the stove lit, I put water on for coffee. Once I had accomplished that, it was only 10 minutes or so until my wife, Char, and I were getting our morning kick-start with cups of freshly brewed coffee in our apartment in Hangzhou1. It is our second morning in this Chinese city of about six million people, and our pound of Caribou Sumatra coffee is quickly disappearing. We brought the coffee partially because of addiction, and partially to keep a hand grounded in American culture while we prepare to wade into one of the most ancient, rich cultures of any country on this third rock from the sun: China. When I do something for the first time, I always have anxiety about what to do, what to pack, which flight to take, should I do this, should do that instead. I am a planner when it comes to travel; I like to know what will happen in order to prepare. Then the thought occurs to me: I can’t do that. The best I can do is prepare to resolve issues and solve problems as they arise. That’s part of travel’s allure, isn’t it? It is the incubator of great dinner party stories (and possibly boring slide shows). We are here for five months. My wife will be teaching conversational English at the Hangzhou Foreign Language School (HFLS). We arrived about 10 days prior to the start of the spring term hoping to give ourselves enough time to get oriented. Let it be known: orientation has begun. It begins two days earlier just after our arrival. We find Bao, the HFLS liaison and our guide for the rest of the day, and learn that Hangzhou is a three-hour drive due west of Shanghai airport along a modern six- and sometimes eight-lane freeway. Signs of modernization and growth abound. New construction rises from property all along the freeway under huge electrical transmission lines that feed China’s electrical grid. I observe that China seems to allow structures to be built much closer to the freeways than in the states. This seems restricted to urban areas in the U.S., although this is perhaps an urban area and I should view this similarly. Our 2 p.m. arrival in Shanghai2, using the money exchange, connection with Bao, and drive to Hangzhou bring us into the city at twilight. That we have arrived in the city is apparent from honking horns and a quick, fluid traffic flow marked by sudden lane changes and few cars signaling their intention to do so. We drive along a major four-lane roadway complete with median and flanked on either side with a 10-foot-wide bicycle path, which is used not only by bicycles, but also scooters and the occasional car. Our Apartment Building. Our apartment is in the second building from the left. A canal flows through the city nearby. We arrive at our apartment and become pack mules. Normally, Char and I travel with one bag each—something on which I pride myself and brag about. This time, we have three huge checked bags weighing between 45 and 50 pounds each, two carry-ons, and two small bags (the kind that the flight attendants say to stow under the seat). We trudge down something like an alleyway, turn left down a walkway between two apartment buildings, and finally, up the stairs to the second-floor apartment apartment. Inside, a wall heater in our bedroom has taken the chill out of the room. The rest of the apartment is cold. A wall heater in the living room remains still. We leave our jackets on. A 19-liter bottle of water stands just inside the door and waits to be lifted into the water heater-cooler. A note taped to the water stand explains how to get another bottle of water: “Call this number. When someone answers, say, ‘A, B, C, D’ and hang up. Someone will deliver another bottle of water within an hour. It costs 10 yuan.” Ten yuan is about $1.60. Bao has ordered an Internet connection prior to our arrival. I get out my computers. Yes—computers. I have brought my personal Mac and my work PC, which I will need to work remotely for my company. We connect them. Everything is working. I am relieved. Bao gives us a phone with pre-programmed numbers. We step into the kitchen. It’s small, but it will work. We look into the bathroom. It’s smaller, and we hope it will work. Nighttime Hangzhou is breezy and cold as we walk down the street looking for a restaurant. Bao points across the street to a grocery store and a convenience store. He explains the use of the bike lane between the street and the sidewalk. He tells us to watch for cars making right turns when we get a green walk signal. A car from behind honks a horn. Bao scoots us out of its path. He explains that this is how drivers tell pedestrians that they are approaching and we need to get out of the way. 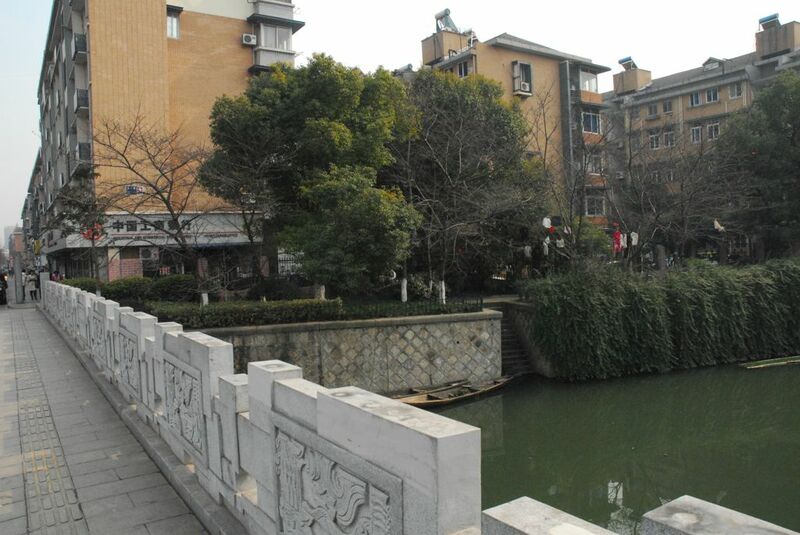 We discover this quickly in the next 48 hours as we walk along some of Hangzhou’s narrow alleys and streets. As we walk past store fronts, I notice the doors to many are open, even as the temperature is 35° F outside. The counter people and attendants inside wear winter coats, just as pedestrians. It’s all quite new to us, but quite common here. Bao selects a restaurant. Inside (this place is heated) we get our first look at a Chinese menu. Lacking pictures, there is no way we can even guess what it might say. Bao asks us what we would like. We decide on a number of dishes. It is the Chinese custom to order several items and then share with the table. We order chicken, which, when served, came in a large serving bowl such as we might use to serve mashed potatoes at Thanksgiving. It was like a huge soup full of various herbs and spices—onions, lemon grass, red chili peppers and other items. These, we are told, were mostly for flavoring. The whole chicken was in the bowl. Bao explained that we were now to dig out pieces of the bird. The first piece of meat I pulled out of the bowl was the heart. I said nothing, and quietly put it back. Char found one of the feet, but ignored it. Bao says that he does not eat the feet either. Or the head, if it is included. We did not find a chicken head. I did find a leg and thigh, but it is rather a challenge to pick meat from a bone with chopsticks. Bao tells us it is acceptable to use our hands. Our dinner also includes a number of other items. We also have fish, served in another large bowl in much the same manner as the chicken. The soupy mixture of herbs and spices contains pieces of a white fish, which we find tasty. We have a plate of pumpkin fries—think French fries, only the strips of pumpkin are breaded and deep-fried. The result is a French fry look-alike. We eat ground pork with egg. It has the consistency of custard and is also quite tasty. Our server brings a hot pot with a fire in it (like a can of Sterno) on which is cooking a small pan of cauliflower. We pick the frying vegetable out of the pan and enjoy its savory flavor. As we walk back to the apartment, we tell Bao that we will probably never eat again as we can’t read the Chinese characters on the menu. In the apartment we crawl into a chilly bed and turn out the lights. In the darkness, we both wonder just exactly what we’ve gotten ourselves into. Our heads are swirling with the many matters we need to address and we share a common anxiety. 1 Hangzhou is pronounced very much like, haan-choe’—haan as in Han Solo in Star Wars, and choe as Joe with a ch. 2 One note about our arrival: we were to meet Bao at a Burger King, of all places. We didn’t find each other for about half an hour, and I suddenly realized I was completely stranded. I don’t know a word of Chinese, have no cell phone, no hotel reservation. This is an odd feeling—the kind you get when you realize that if you don’t make your connection, you will have your first problem-solving exercise of the journey. Hi Char and Joe. So happy you are there safely. This brings back so many memories..I remember arriving in China and thinking ‘I’m not in Kansas anymore’! Stay safe and careful of what you eat! I am so glad you are there; the first hurdle is over. You two adventurers will dive right in and have a wonderful time….. WoW!!! Exciting! Daunting! Great report. Thanks. Rest. You are seasoned travelers. Rest and a little time will turn it into the adventure you expect. Joe, I suspect that you may not have trouble with continuing to lose weight. I can’t imagine picking a chicken heart out of a bowl of soup! Hopefully you’ll be able to stay warm enough to get your work done. This is so exciting — but I’m kind of glad you’re handling the real excitement and I can sit here comfy and full reading about it. I would skip the chicken feet too, Char. Any bird nest soup on the menu? The grocery store sounds better right now. What a great adventure. Best of luck in school. No one could handle all of this better than you two. Joe, what a wonderful narrative of your experiences. I admire both your spirit of adventure and your ability to find time to craft a wonderful description of it all. We just returned from AU/NZ. We had an amazing trip beyond our expectations. I am reading your blog with fascination. It reminds me of my Warsaw experience in 1983 teaching in the UNESCO English-speaking camp and living in a dormitory for 3 weeks. It was exactly as Joe explained–putting tissue in a basket, toilets that didn’t flush (we had a bucket, filled it with water, and went back into our stall and poured the water down the toilet to flush it!). What an adventure for both of you. Won’t you appreciate your home and living in America when you get back?! I know I certainly did.